In highlight of the new top smartphones Galaxy S8 and Galaxy S8 Plus is the Samsung DeX station. 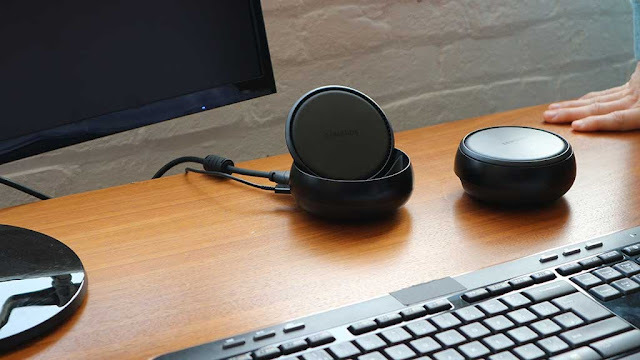 This docking station is not only for charging the smartphone, but turns it into a functioning computer similar to Windows Continuum, just with Android as the operating system. Remarkable: While the S8 will be on the market only on April 28 (April 21 for pre-buyers), the docking station should be available sooner. The Samsung DeX station could be ordered among other things already at Amazon at the Vorbesteller price of 116.89 euro (instead of 149.90 euro). Whether the price is a pre-buyer discount, is unclear. The shipping should actually start from April 7, but Amazon ruled back and did not deliver. In the meantime, the price has climbed to 134.95 euros and the delivery time is now "Usually ready for dispatch in 1 to 3 months". Two USB 2.0 ports are installed on the dock, where the keyboard and mouse are located. Alternatively, these can also be connected via Bluetooth or radio. WLAN and mobile data connections are not possible via DeX, but a 100-megabit network connection is available. The dock has an external power supply and an active cooling system for the Galaxy S8. And this is also useful as the smartphone sends screen resolutions in 4K resolution with 30 frames per second to an HDMI-enabled monitor. Under these conditions, the smartphone quickly heats up. At the same time, the DeX station is also a charging station, which supplies the device quickly with current via USB Type C and the fast charging technique "Adaptive Fast Charging" - but this only works with the charging cable included in the S8 delivery. COMPUTER BILD already had a first look at the DeX station and the user interface "Samsung Galaxy Desktop", which provides for a PC-like view. When installed apps have the multi-window function, they run in a separate window - just like the computer at home. Even the mobile applications of Microsoft Office, Adobe Acrobat Reader Lightroom work perfectly. Samsung has worked closely with Microsoft and Adobe. Samsung's PC mode covers nearly all tasks of a conventional computer - surfing the Internet, streaming, watching pictures and videos, and much more. Interesting for corporate customers: Remote access to virtual systems such as Windows, for example, is possible with solutions from Citrix, VMware and Amazon Web Services (AWS). Samsung Knox ensures security. However, Samsung's idea is not very fresh, as Microsoft has already equipped its mobile operating system Windows 10 mobile with the Continuum function in 2016. This also allows the smartphone to be converted into a fully functional PC workstation - with the Docking Station Display Dock. In addition, a Windows Phone smartphone, mouse, keyboard, monitor and hard drive can be easily connected to each other. With the release of Windows 8 in 2012, Microsoft began to bring Windows to mobile devices - initially with moderate success. Meanwhile, the Group has significantly improved the operation with Windows 10. The DeX station comes with a price recommendation of 150 euros on the market. If you order the Samsung DeX Station from Amazon , you currently only (as of 7 April 2017) only 116.89 Euro. In some countries, Samsung also offers the DeX in a bundle with the S8.